Filed to: Smiles, everyone... smiles!Filed to: Smiles, everyone... smiles! After a bit of clutching around in Los Angeles traffic and enjoying some nightlife, we're loaded up and ready to roll a pair of Ducatis up the coast to the big Moto GP race at Mazda Laguna Seca Raceway. 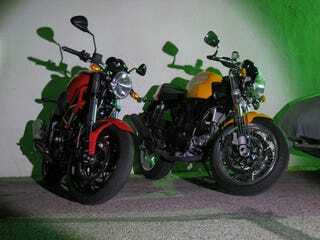 On deck are a Monster 695, and a Sport 1000 Monoposto. We'll be coming to you as live as technology allows from the event. We're hoping a Volare wagon with a candy striped canvas top will pick us up trackside, and bring us to Ducati island.